It provides comprehensive language development integrated with exam-task familiarisation. There are exercises to help students avoid typical exam mistakes. This topic-based course covers every part of the exam in detail, ensuring that students are fully equipped to tackle each part of every paper. Exam information and Exam advice is offered throughout, culminating in Exam round-up sections, which check that candidates know how to approach each paper. 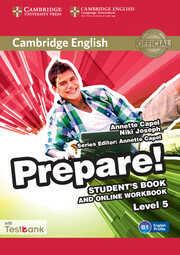 The accompanying CD-ROM enables students to work at their own pace. 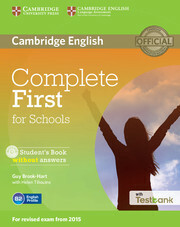 A Testbank access code for four online Cambridge English: First for Schools practice tests is inside this Student's Book (class-code from teacher required).